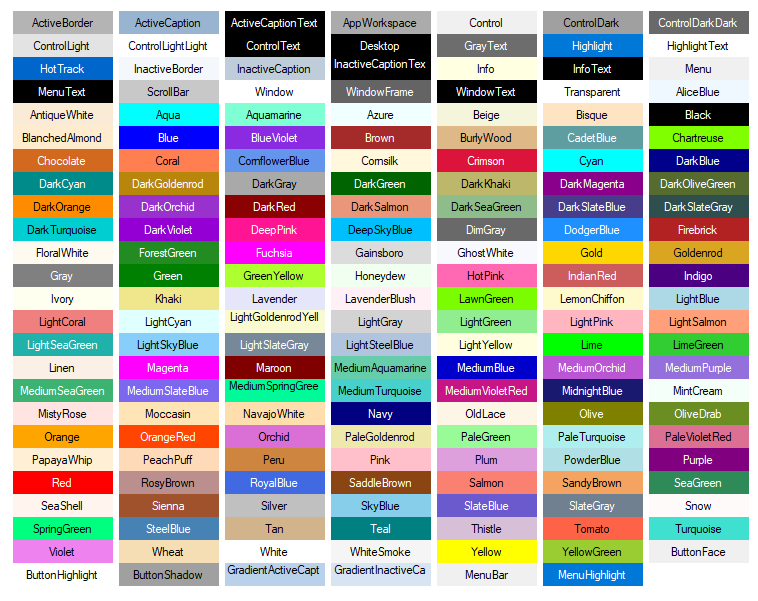 I have a random color for my background in my windows forms application. Now I want to display a label. But when the random color is white and the label also then the label is not visible. There are various ways to ensure a proper contrast. Option one : I usually stick to keeping the text Black or White, depending on the brightness of back color. Unfortunately this is not really a good solution, as the result is not perceptually correct; to wit: Green and Yellow have the same values, which is obviously not what our eyes will perceive. Option two : If you want to get colors in the foreground you could pick it randomly and repeat until you get a decent contrast by comparing e.g. Note that you must not push the epsilon value too high or else it won't find a suitable color. This happens when trying to find a color that is too far away from a medium brightness! You could add a counter and after a while pick simply black or white..
Option three : Yet another way would be to construct a color with Color.FromArgb(). You could start by inverting each channel, which will give nice color contrasts; but if the color one is of medium brightness and/or saturation you would have to correct, maybe again by picking black or white.. Note: for the above image I have enumerated all KnownColors, which already looks pretty random. Not the answer you're looking for? Browse other questions tagged c# windows forms colors drawing or ask your own question. How do I invert a colour?